(17/P88) TRENTON – The Christie Administration has awarded Perth Amboy $7.1 million in grants toward a project to convert a former scrap yard into a green space that will provide public access to the Raritan River and help improve water quality, Department of Environmental Protection Commissioner Bob Martin announced today. 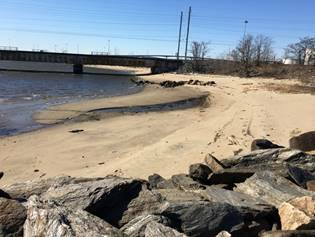 The Perth Amboy project will remediate the six-acre brownfield site off 2nd Street and construct ecological habitats, living shoreline and green infrastructure to improve water quality in the river and provide recreational open space to the community. Money from Natural Resource Damages settlements secured by the DEP is funding the $4.6 million Perth Amboy project grant. The city has also received $2.5 million from the DEP’s Hazardous Discharge Site Remediation Fund. Under the Christie Administration, DEP and Perth Amboy have worked cooperatively through the Community Collaborative Initiative (CCI), a joint effort of the DEP and the City’s Green Team. Perth Amboy designated the site an area in need of redevelopment in 2000, and in 2003, acquired through eminent domain, the six-acre former Harry Goldberg & Sons Scrap Yard. The site was used to recycle metals from 1904 until 1994. Soil contaminated with metals and chemicals from the operation will be remediated as part of the project. In May 2014, the Middlesex County Improvement Authority, working with the City of Perth Amboy and PARA, utilizing funding from the U.S. Environmental Protection Agency (EPA) Brownfields Program, contracted with a team of community planning specialists from the Edward J. Bloustein School at Rutgers University and landscape architects from Rutgers’ Center for Urban Environmental Sustainability to develop a design to meet the needs of the surrounding neighborhood residents. Rutgers conducted an extensive community outreach process, receiving feedback from more than 500 residents, students and members of the surrounding neighborhood. They used this feedback to develop a concept design for a healthy, safe, clean, resilient, active, connected and educational park. Because of the extensive community engagement and support, this project became a top priority for the CCI. The project is among 13 to receive a total of more than $9.5 million in DEP grants that will improve surface-water quality by implementing a variety of strategies to reduce stormwater pollution in local communities. The Water Quality Restoration Grants for Nonpoint Source Pollution program enables municipalities, nonprofits, academic institutions and other partners to develop projects that enhance protection of waterways in their communities. The program is made possible by funds from the state’s Corporate Business Tax, money from the Natural Resource Damage (NRD) settlements the state has secured with polluters, and money from the federal Environmental Protection Agency’s Clean Water Act 319(h) program.